Interested in being an F3 Supporting partner? You have three easy ways to get your company involved. If you have a website where customers can order your products, you provide a click-through interface that allows the customer to make a voluntary donation to F3 after totaling up their purchase. They have a choice of either rounding up their purchase price to the next whole dollar amount and donating the difference, or adding a whole dollar amount of their choosing by clicking on a button that shows that amount. 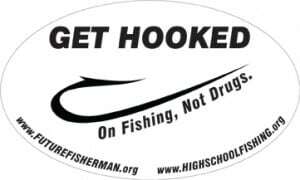 Participating retailers can purchase an F3 Point of Purchase Fundraising Display for selling top-quality sunglasses and F3’s “Hooked on Fishing Not on Drugs” window stickers. 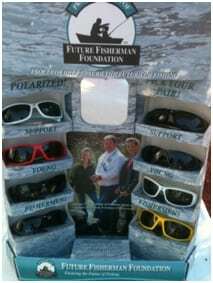 Each kit comes with six pairs of polarized sunglasses and 60 of the popular stickers, along with the display that fits perfectly at almost any checkout counter. Participating companies earn profits of almost 50 percent. When the display is empty, simply reorder to refill the display and the profit margin goes up even more! Complete list of partners coming soon.